He smiled when he could put you in one of his “quality used cars,” and he smiled when he could find some way to help those who needed it. 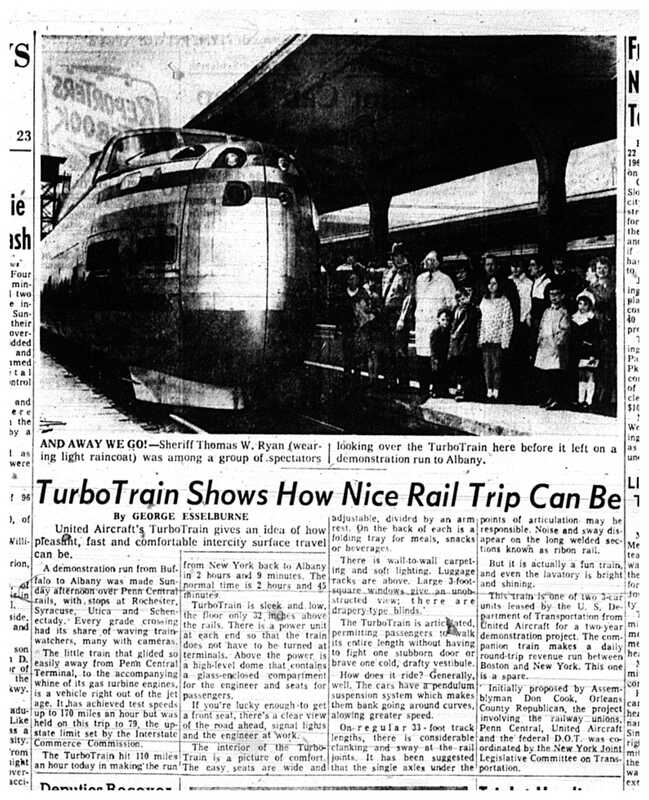 From 1961 until his death in 1996, Thaddeus Sawicki lived up to the name “Smiling Ted” in just about every way imaginable. 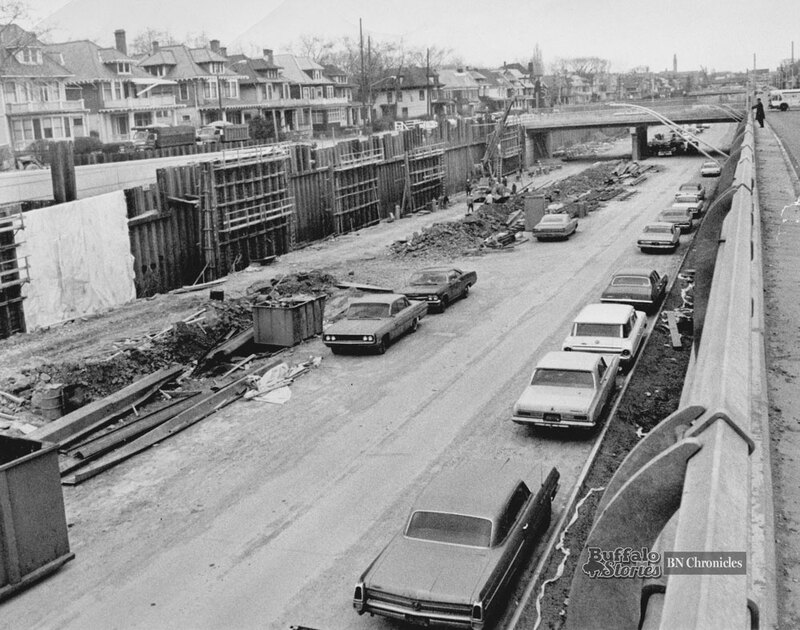 He was the king of the stretch of Bailey Avenue that was known for decades as a sort of shopping mall for used cars. 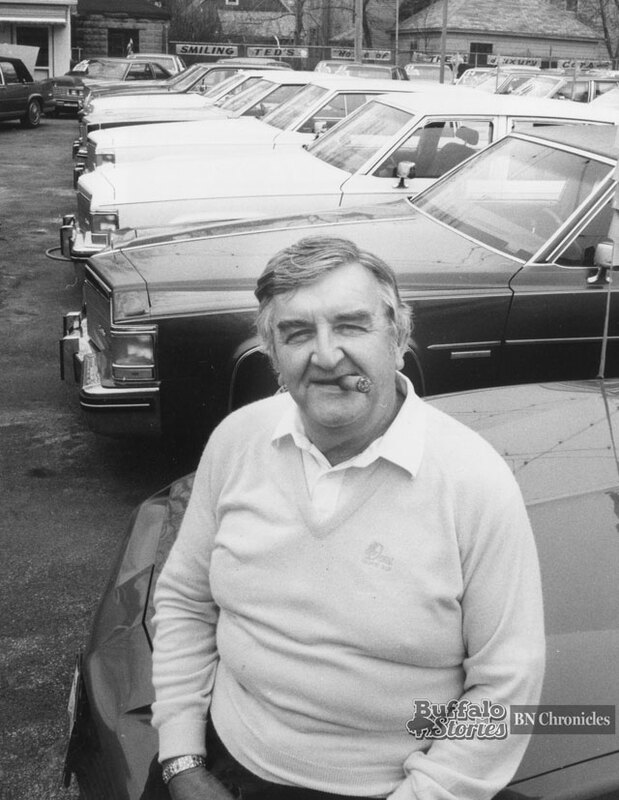 Cigar-chomping, gold-jewelry-wearing Sawicki embraced the happy-yet-no-nonsense persona he created, but not the shady, high-pressure, corner cutting notion of what some thought every used car dealer was. 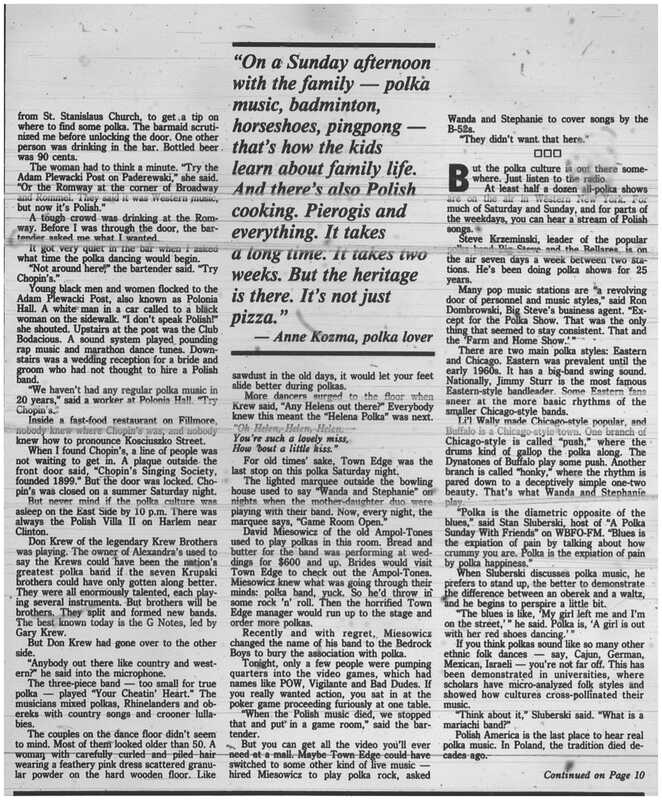 Sawicki, the youngest of 12, grew up in Lackawanna, and he opened the dealership near Bailey and Walden when he was 28. 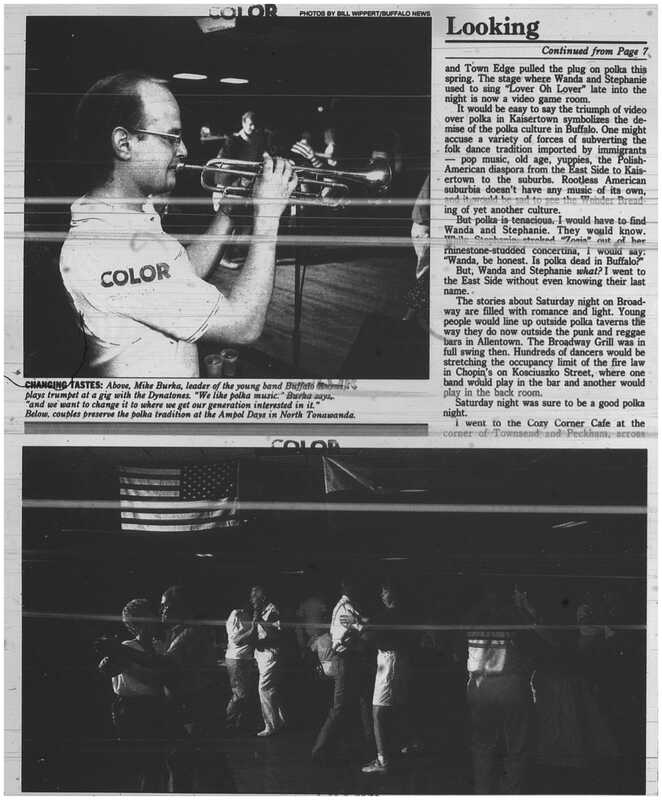 Over the next 35 years, he became a fixture in the community. 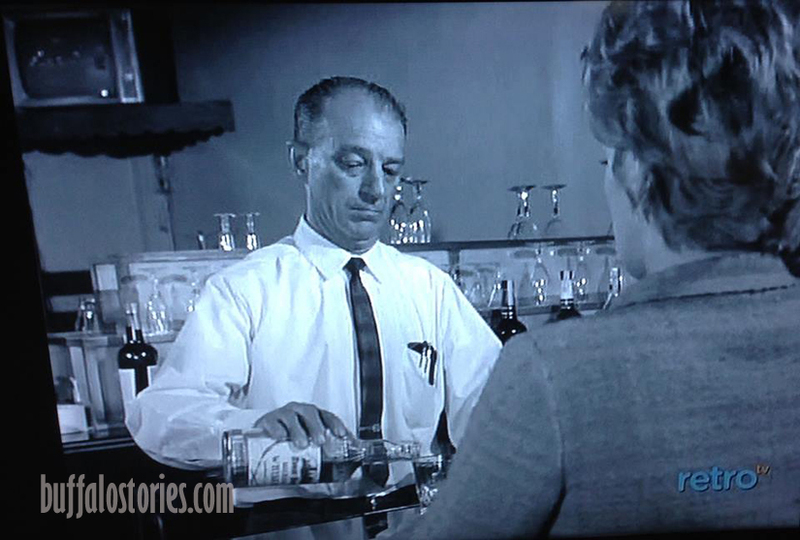 Twice he helped police collar thieves trying to sell stolen cars. He also remembered growing up wearing hand-me-downs and putting cardboard in his shoes. 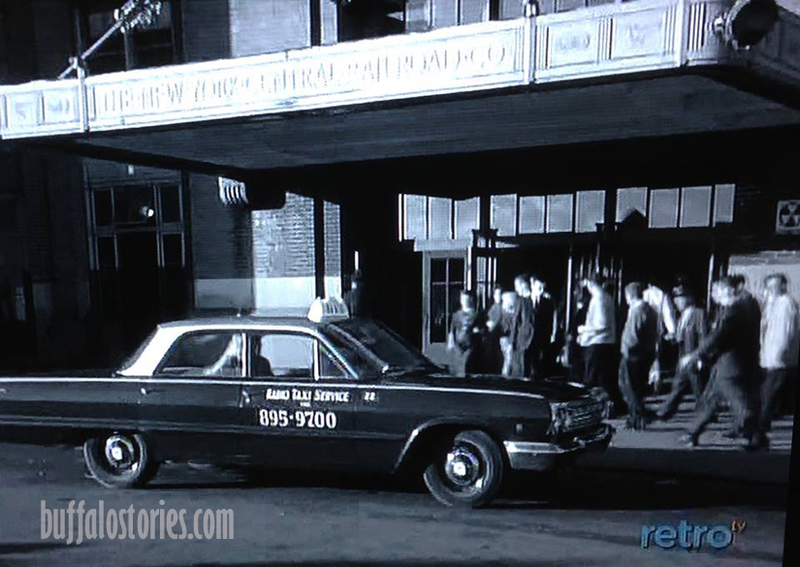 It made it easy for him to help the community’s neediest. 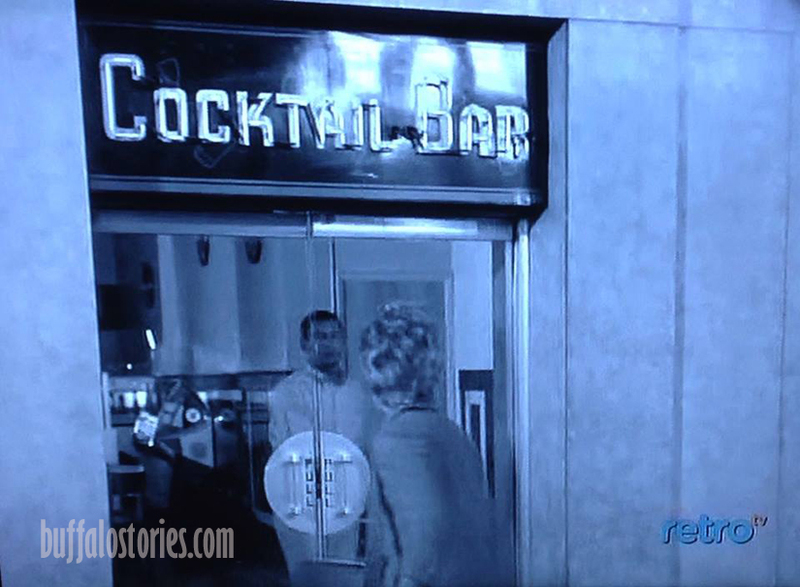 Smiling Ted’s story is a prequel to the Russell Salvatore story: Both were self-made businessmen from humble beginnings, and both believed in giving back to the community that built them up. 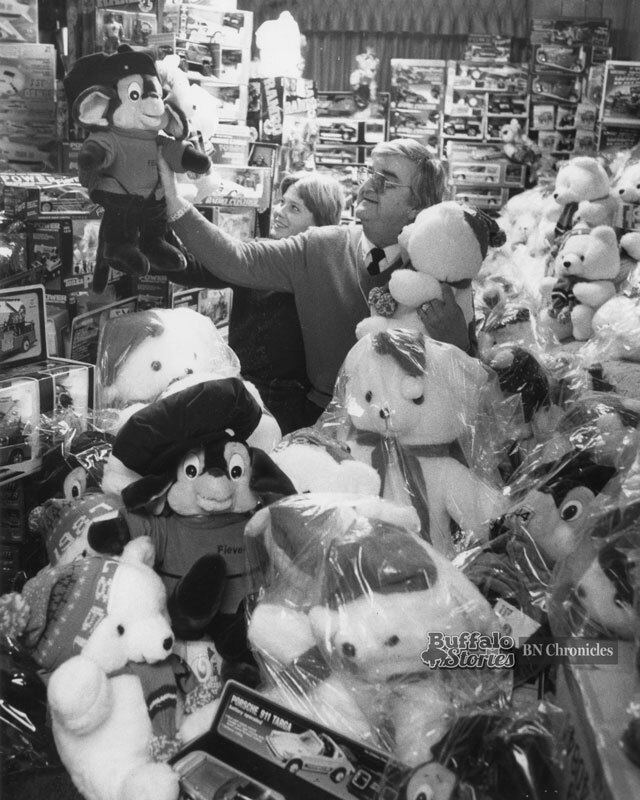 In 1987, Sawicki (pictured above with his grandson Ted Jr.) spent around $45,000 buying Christmas gifts for 1,500 of Buffalo’s poorest kids. 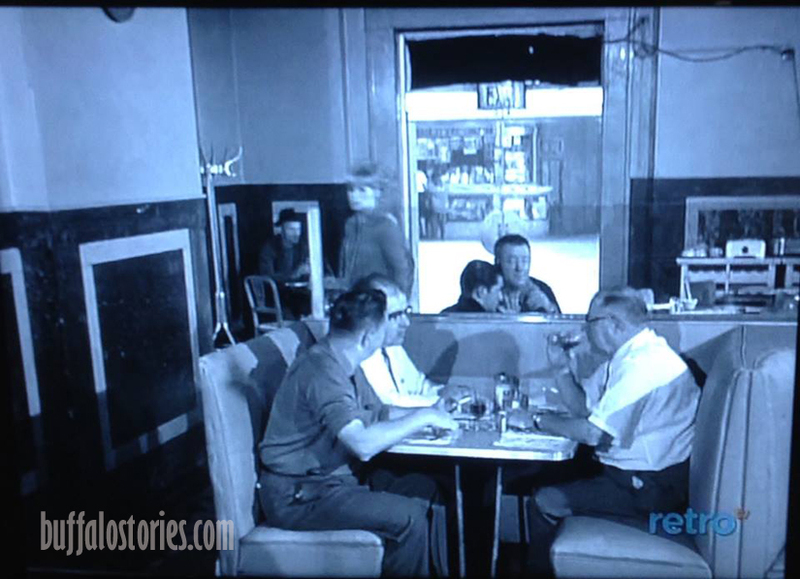 The same year, he bought dinner for 800 at the City Mission, “including real butter and sugar on the table” for Christmas. Part of it was wanting to help, part of it was wanting to defeat the attitude towards used car dealers which lead to some banks not working with him or his customers, especially in the earliest days of his business. 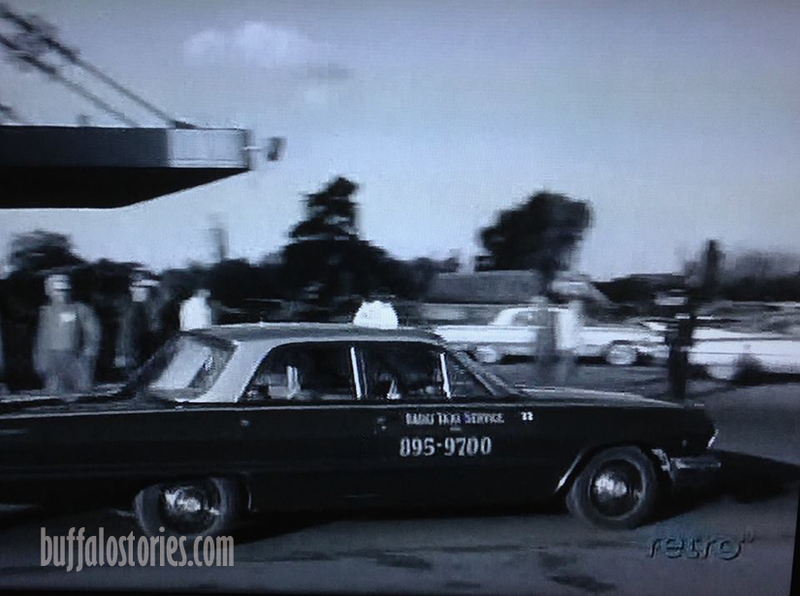 Sawicki told News Reporter Ray Hill that he’d seen used car dealers come and go — and that the fly-by-night ones always made his honest work more difficult. 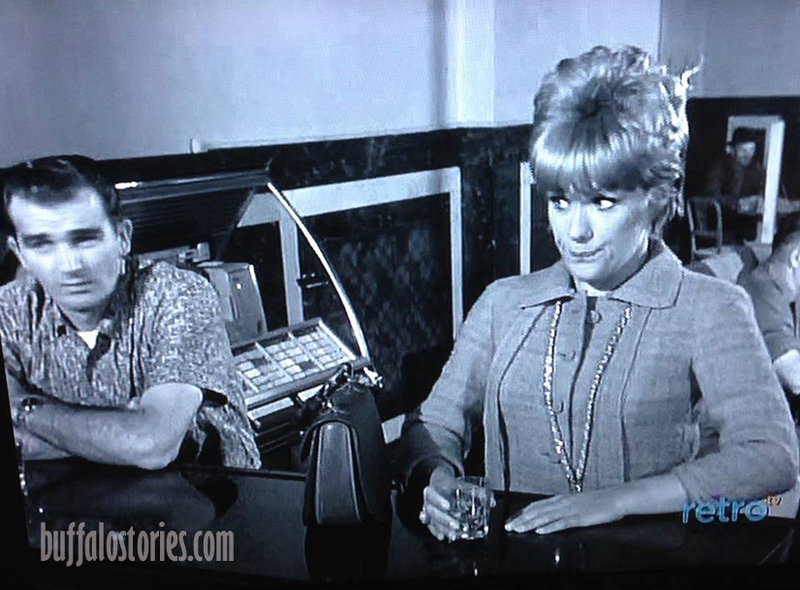 “It was the Dan Creeds of the world that made my life difficult,” Smiling Ted told Ray Hill. 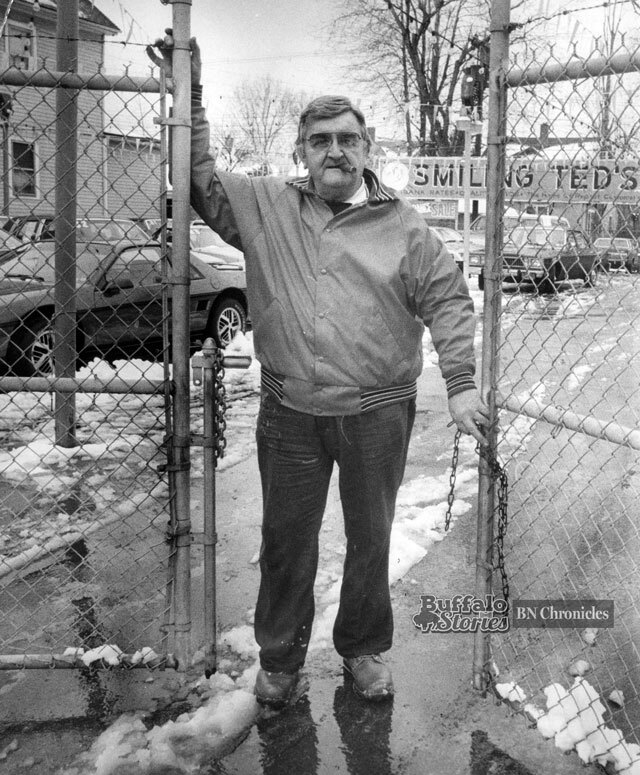 But Smiling Ted was definitely one of Buffalo’s all-time great characters. One of the less-celebrated and remembered industries of Buffalo’s past is livestock trading. 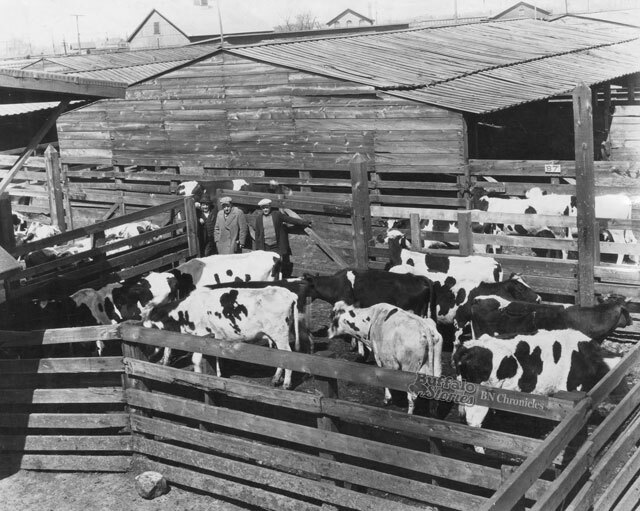 In the 1880s, the East Buffalo Stockyards made Buffalo the world’s second largest livestock market. 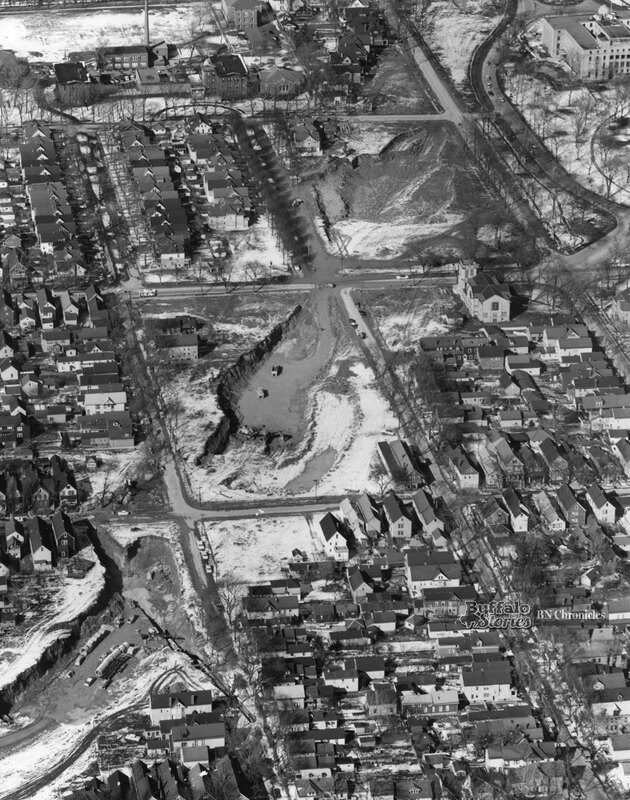 About 100 acres of Buffalo’s East Side was dedicated to the livestock trade. For decades, every day thousands of animals made their way to and from Buffalo between their time on the farm and the table. 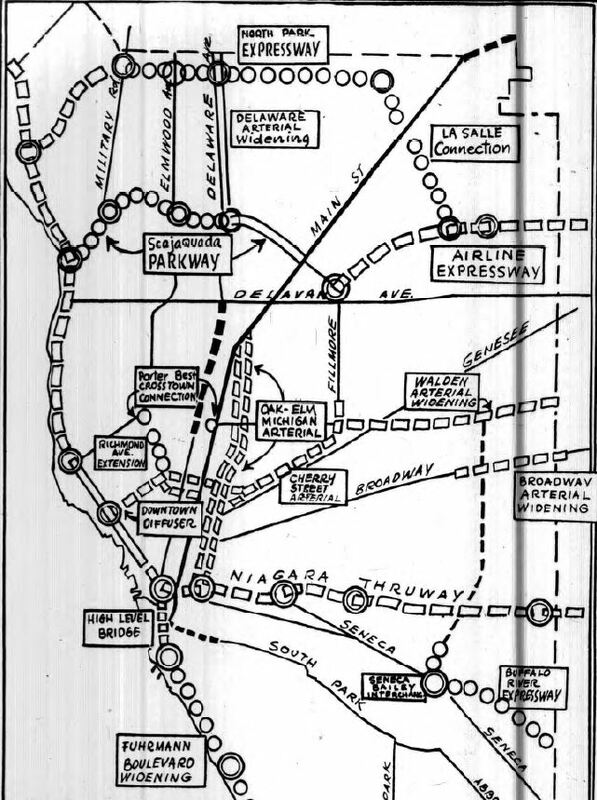 Buffalo’s place next to Chicago as a hub for the trade of livestock was sealed when the New York Central and Erie railroads created a more efficient animal delivery framework in 1864. 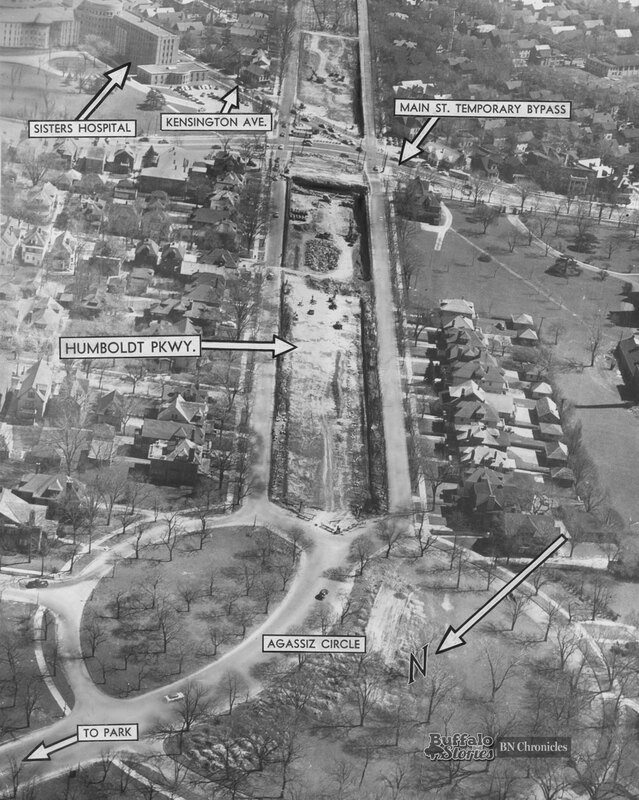 The pens and pockets between the New York Central tracks and William Street had capacity for 35,000 hogs, 40,000 sheep and 25,000 cattle. The each year of the 1890s saw about one million cattle, 5 million hogs, 2.5 million sheep and 75,000 horses pass though. Much of Buffalo’s early wealth was derived somehow in the trading of animals. 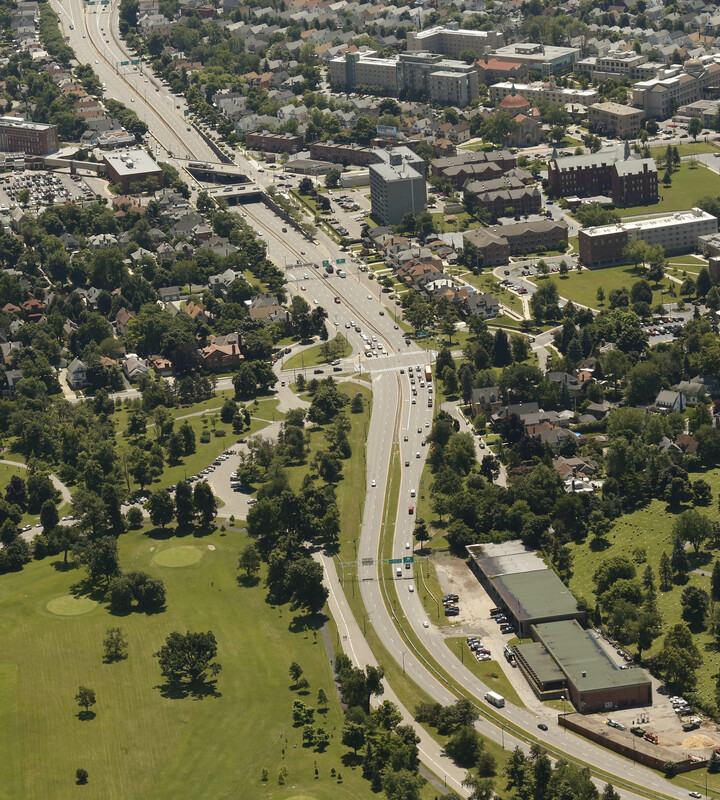 Virgil Bailey, after whom Bailey Avenue was named, was a horse trader. The Larkin Empire started when John D. Larkin came to Buffalo in 1875 to make use of the fat rendered from animal slaughter in the making of soap. The iconic Sahlen’s hot dog, still made on Buffalo’s East Side, can trace its lineage back to the Sahlen and Roland Meat Packing Company founded in 1869. 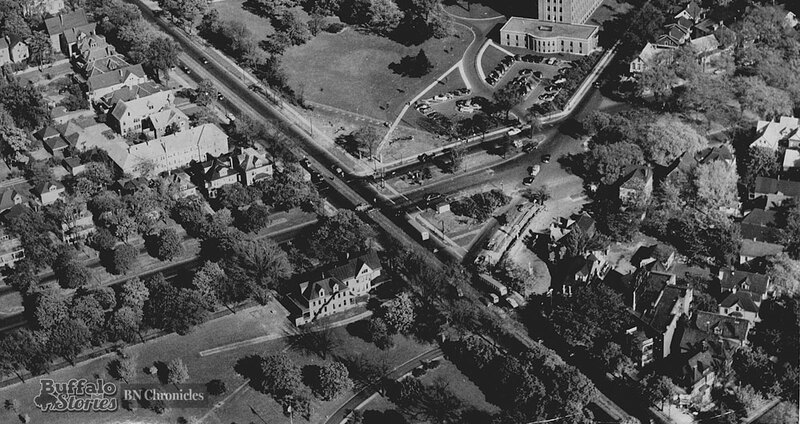 The Stockyards gave way to the William Street Post Office in the late 1950s, and in 1964 — 100 years after centrally organizing the stockyards on William Street — the New York Central closed its East Buffalo Stockyards station and got out of the livestock business in Buffalo. 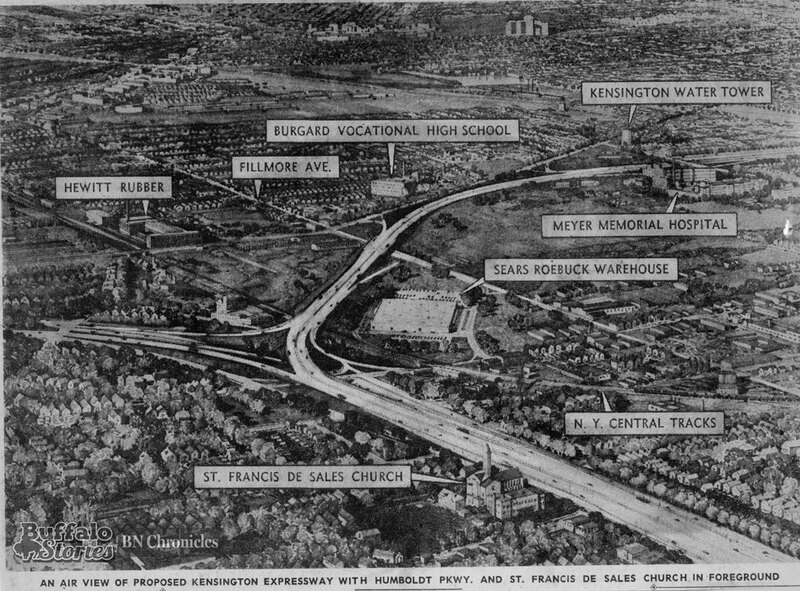 Some spinoff industries, like leather tanning, left when the railcars mostly stopped. 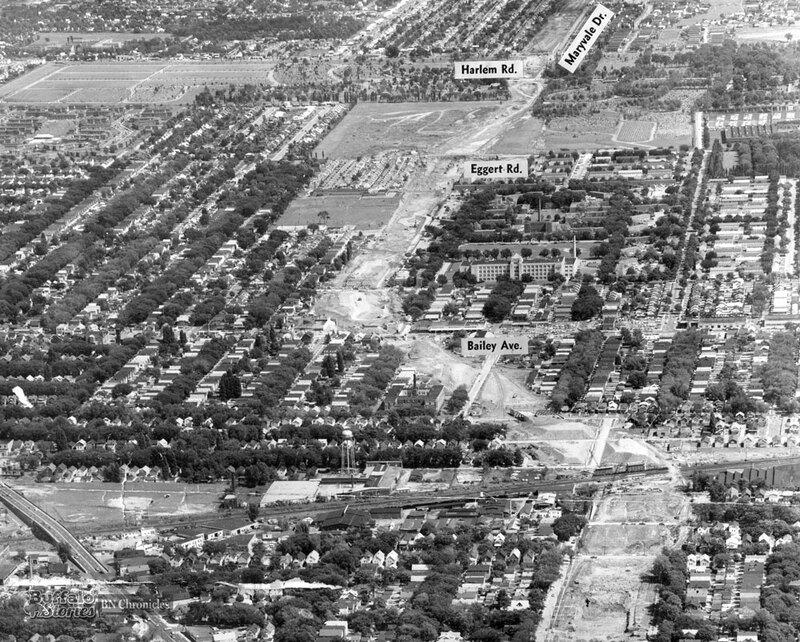 Other spinoff industries, like Sahlen’s Meat Packing and others, continue on Buffalo’s East Side to this day. 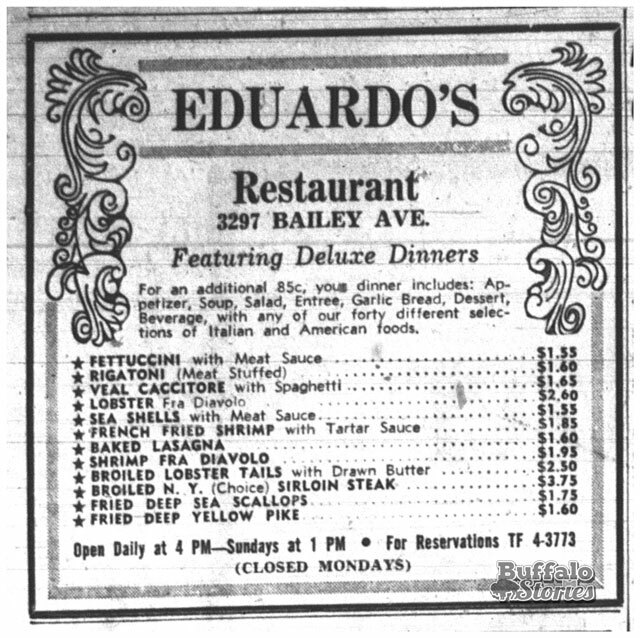 Eduardo’s Restaurant on Bailey Avenue at LaSalle survived long enough to be remembered differently by different generations. 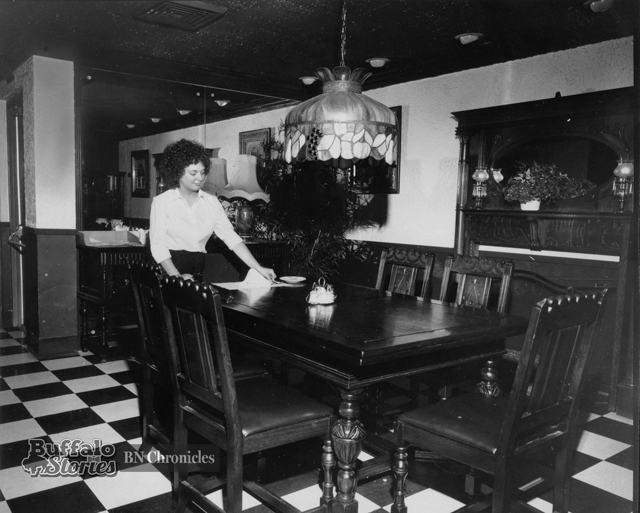 The Tarquini family started what wound up being a chain of seven restaurants in 1953 on Bailey, and it quickly became one of Bailey’s most popular pizzerias. 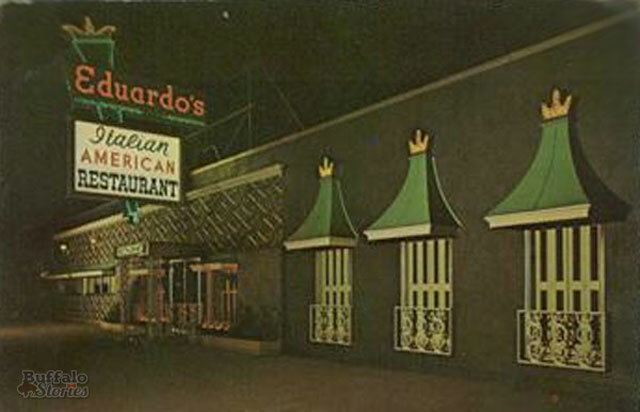 Before Eduardo and his wife, Alice, retired from the business in 1980, the original Eduardo’s had been a pizzeria, a 1960s-style nightclub with live music, and a 1970s-style club as well. The address that was Eduardo’s for a quarter century is now a mental health services clinic. 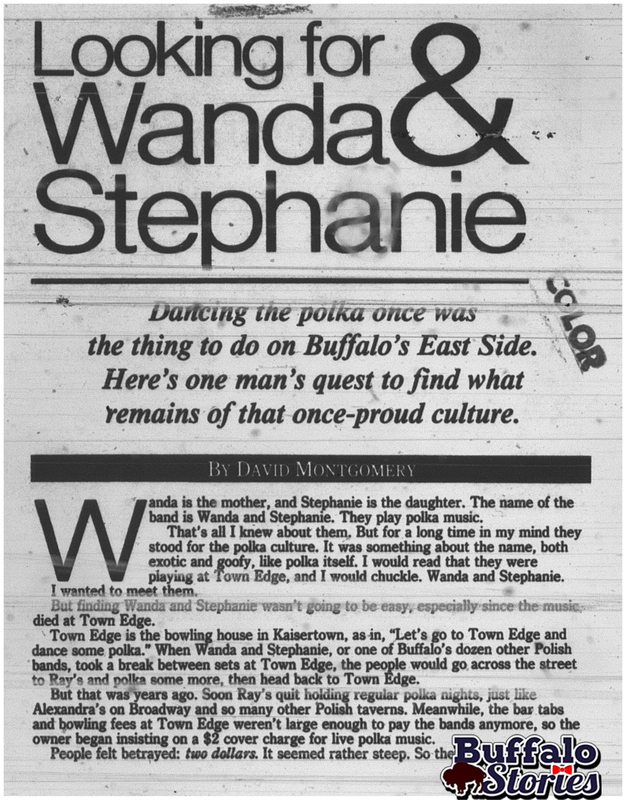 For decades, Buffalo’s East Side was the cradle of the city’s Polonia culture. 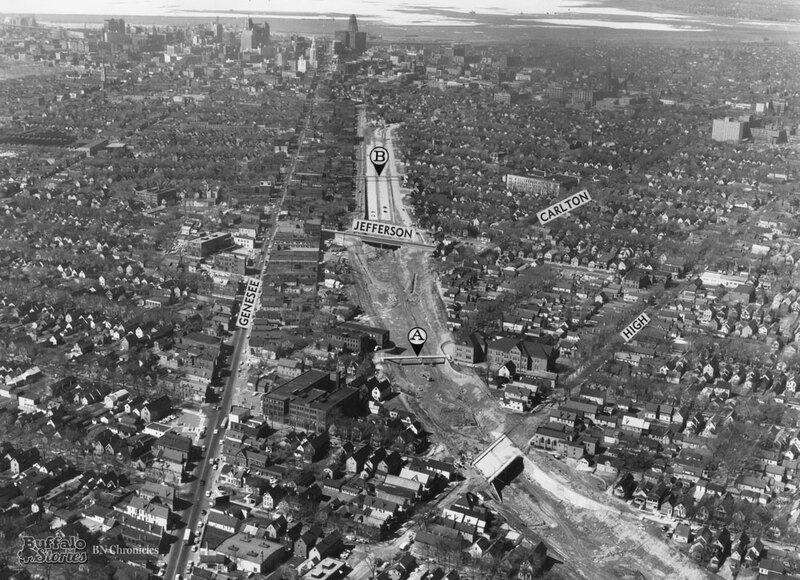 As people and institutions of Polish descent left the East Side, Buffalo’s unique blend of Polish and American traditions became spread out and not as easy to identify. 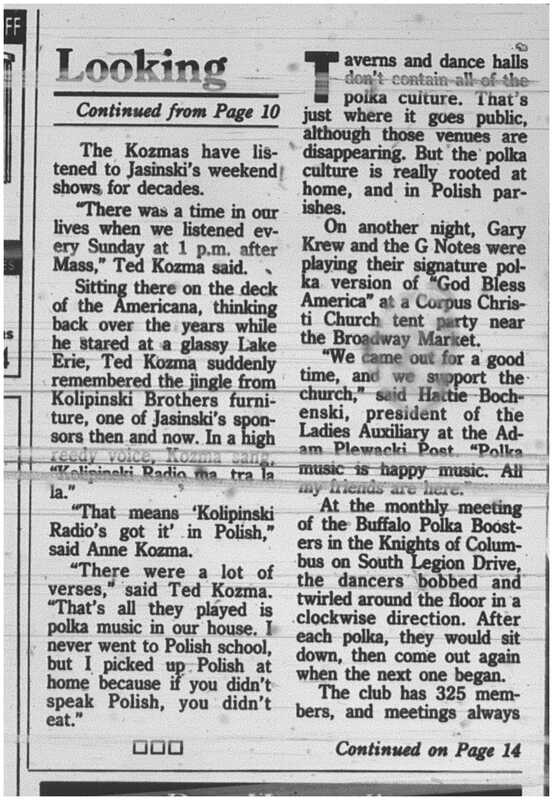 Twenty-five years ago, The News was asking whether Buffalo’s polka music culture was dead. 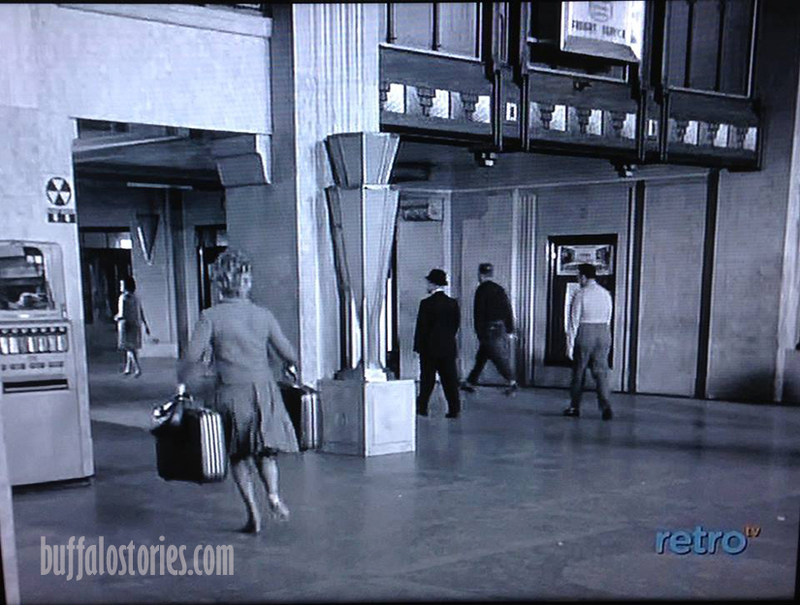 Flipping through the channels we get over the air without cable, and I saw black & white video that looked like Buffalo’s Central Terminal. Turns out, it was!! 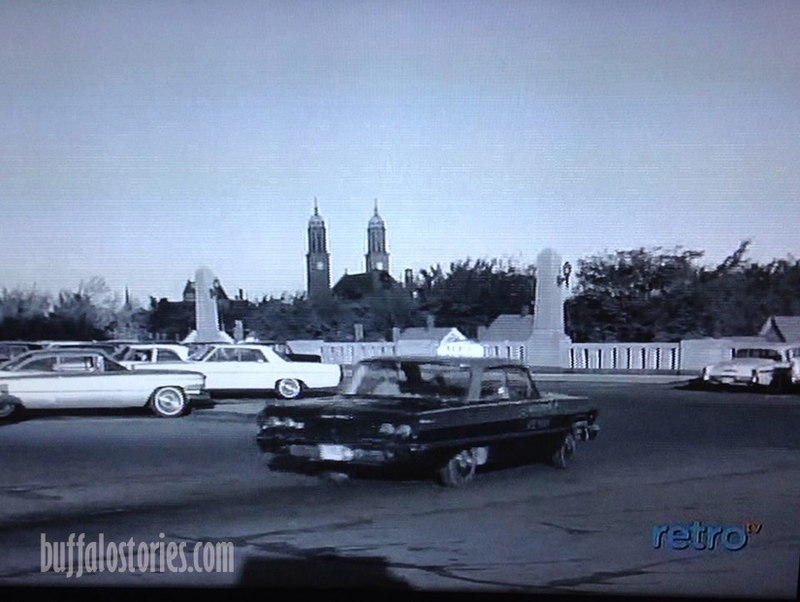 The opening five minutes or so of a 1963 episode of Route 66 was shot inside the New York Central Terminal, with some looks at the surrounding area as well. 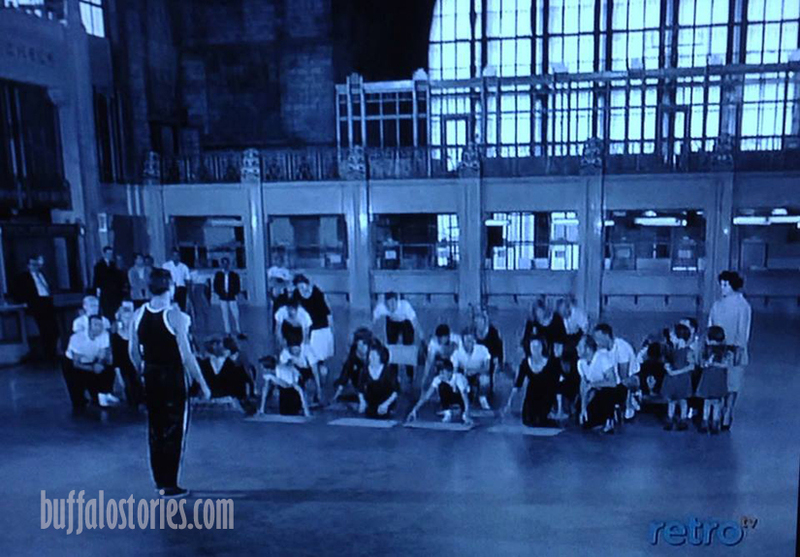 The Central Terminal part of this episode was also posted on YouTube some time ago. 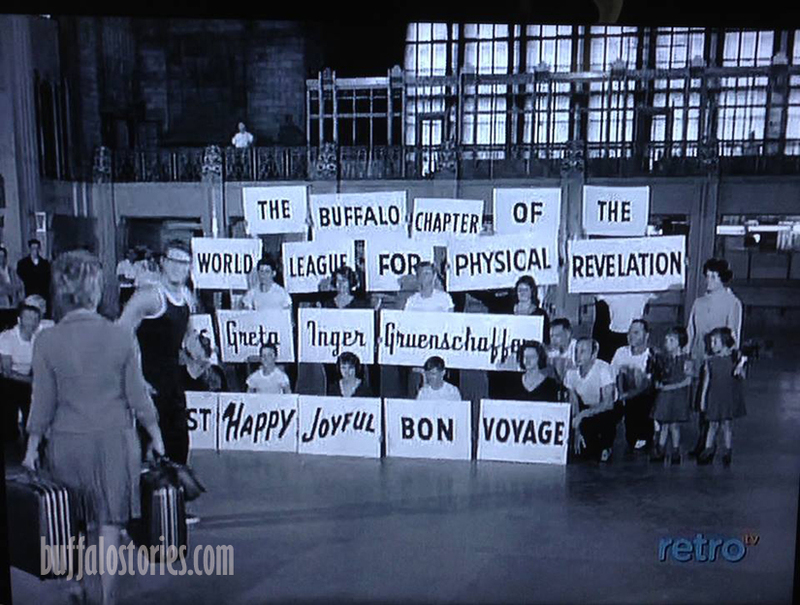 Buffalo, NY – The Rev. 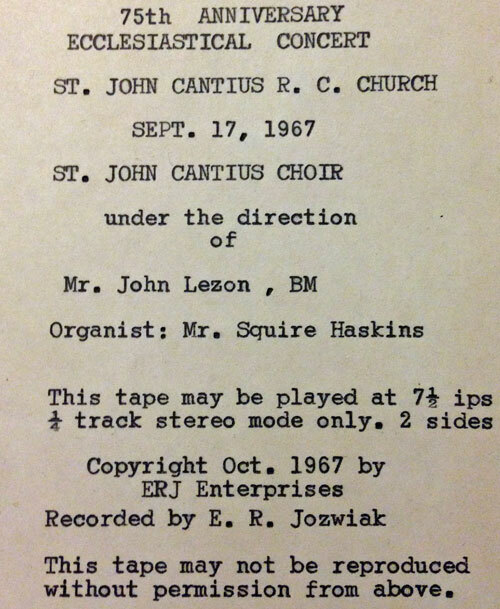 Henry Orszulak grew up in the St. John Kanty parish on Buffalo’s Polish East Side in the 1960’s and was excited to get his hands on three reel-to-reel tapes from the church’s 75th anniversary year in 1967. 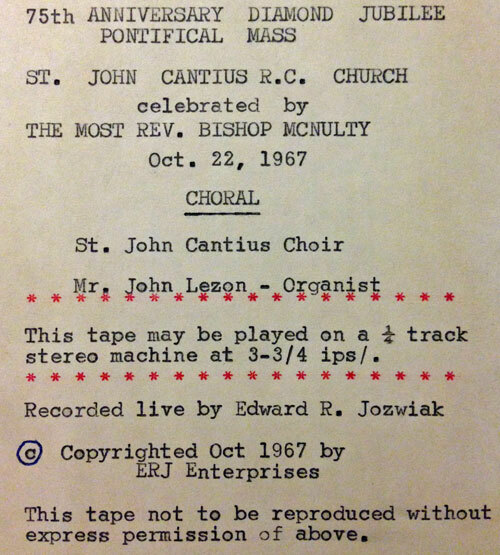 Despite being nearly half-a-century old, two of the three St. John Kanty tapes sounded great. 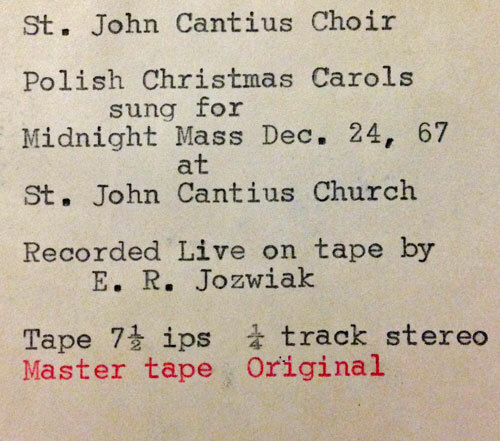 The recordings of Mass and the Christmas carols actually sound as good as they did in 1967. 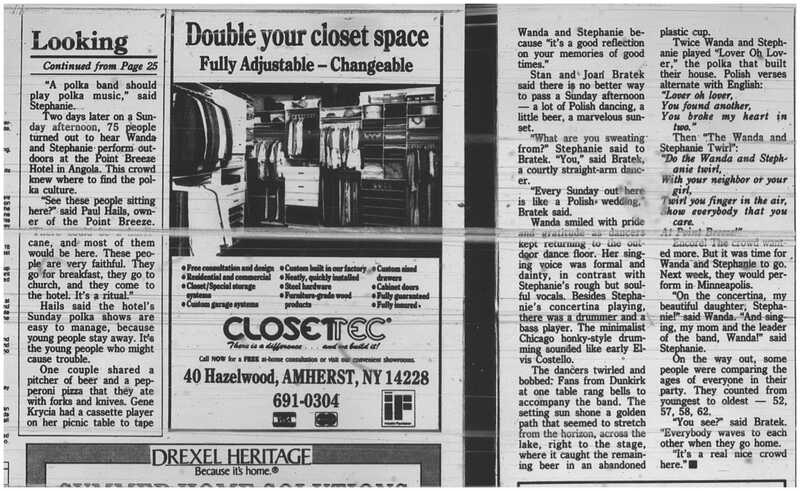 The concert, however, didn’t fare as well. 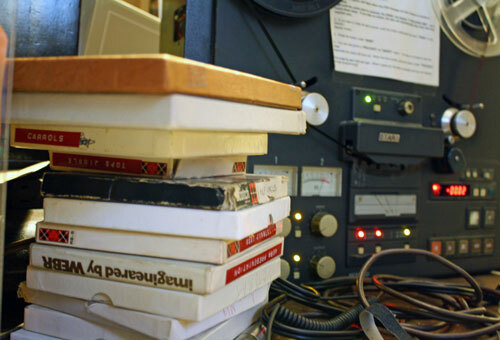 Despite trying to play the tape back on several professional and consumer model reel-to-reel machines, significant bleedthrough and ghosting have permanently ruined the tape. 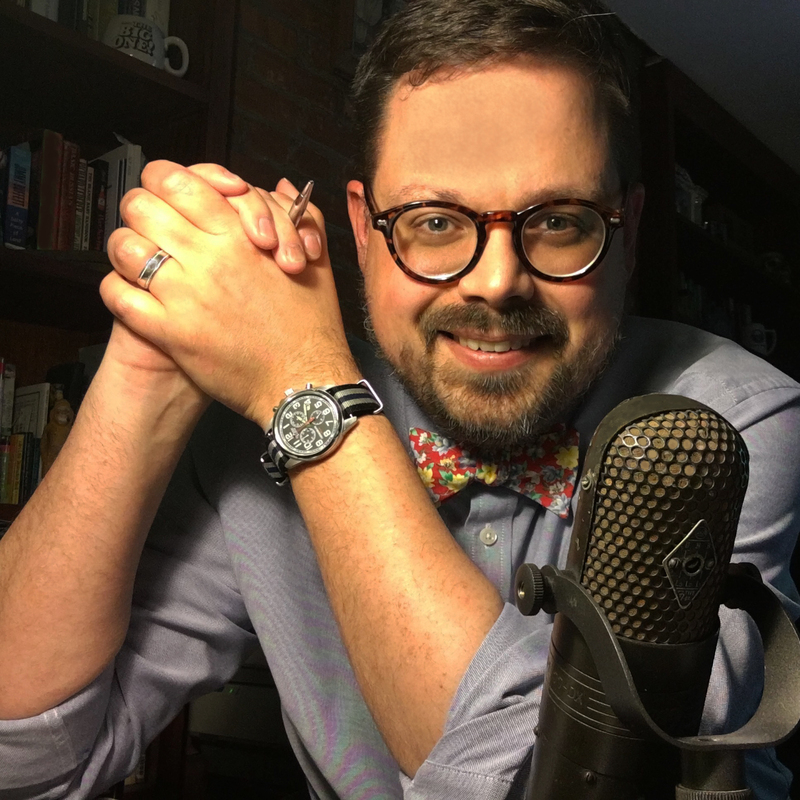 It makes audio that remains difficult to listen to– although I did post a portion of it here anyway. It’s still beautiful to listen to if you can fight through the backwards organ music and singing over significant parts of it. These descriptions were taped inside of the boxes. 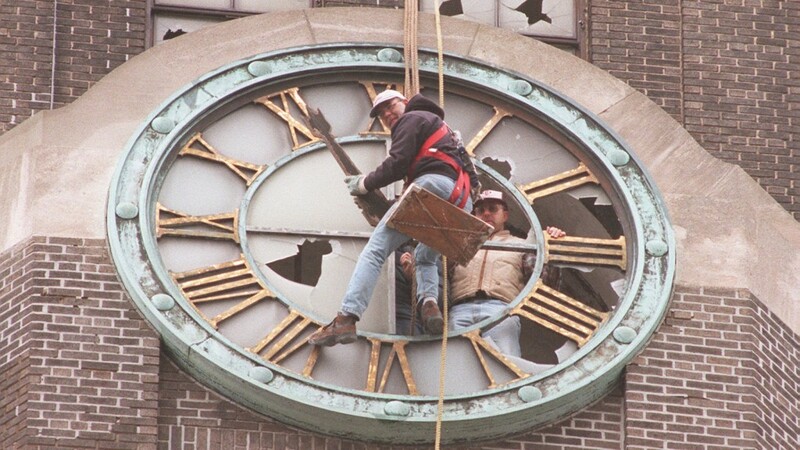 “Jeff Ingersoll swung in the raw wind outside the broken face of one of the New York Central Terminal clocks Friday, marking the start of a $15,000 project to restore time to the old landmark. 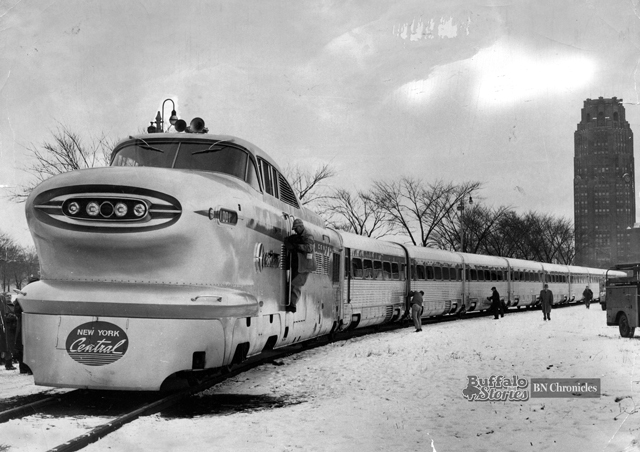 Buffalo in the ’60s: Will high speed trains soon be barreling through Central Terminal?